Edwards Gibson were pleased have sponsored the 'Real Estate Team of the Year' Award at the Legal Business Awards 2019. 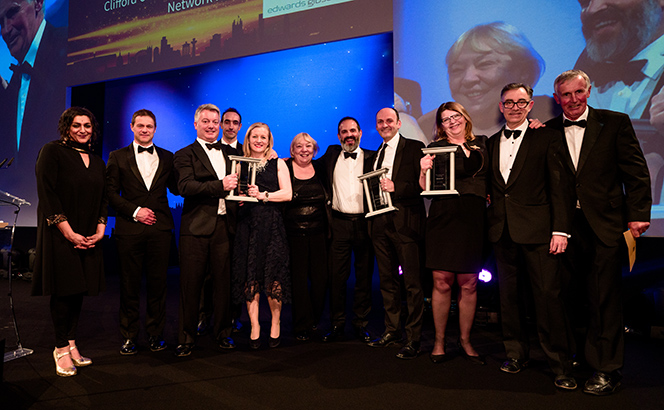 We are delighted to congratulate Clifford Chance/Eversheds Sutherland/Network Rail (Angela Kearns, Nicholas Bartlett, Cathy Crick) for winning the 'Real Estate Team of the Year' Award, which was presented by our very own Senior Adviser and two-time winner of the Award, Jon Vivian. Well done also to the law firm/in-house duo Burges Salmon/Transport for London (Philip Beer, Katie Sullivan) who were highly commended. For this award, judges were looking for a standout example of real estate-related work, including financing, development or construction, or cases and transactions in planning, environment and regeneration areas.